Check out my students' blogs! I have tried (and failed) at incorporating bell ringers into my class in the past, but this summer I stumbled across something that I knew I had to try. I read a post published by Edutopia on their Facebook account which suggested that covering a poem each day with students can have a dramatic impact on their outlook and understanding of poetry. I like to teach what I love, and I don’t love poetry. I usually teach a short poetry unit at the end of the year which encourages students to explore types of poems they like and write their own poems according to style guidelines (aka- go outside and write nature haikus when the weather is nice). We don’t spend much time analyzing, and we don’t give the classics the time they deserve. I knew I was doing my students a disservice by not covering poetry like I should. I also knew that I was going to have two sections of college prep English 9 this year, and many of those students would later go on to take AP English classes which would require them to critically analyze poetry more frequently. I wrote a post a while ago about the power of working outside your comfort zone, and I thought this might be a great way to cover poetry without the overwhelming stress that a poetry unit brings me. My school bought a school wide contract with Blackboard in January, so I decided I would use Blackboard for my students instead of Google Classroom or Edmodo which I have used in the past. I have taken some of my master’s courses online, so I’m familiar with forum/discussion posts. When I realized Blackboard has the capacity for forum posts, I thought this might be a great way to incorporate my daily poems. I did some Googling over the summer and began to compile some poems that I liked. They had to be short enough for students to do a quick reading and have a general understanding and they had to be interesting. I was able to find more than enough poems to use for the year. Some of the poems are classics that any English teacher would suggest I teach. Some of the poems are silly. I loved reading Shel Silverstein when I was a kid, so his poems show up throughout the list. I created a folder in my google drive and started saving poems. I did a new doc for each poem and saved them all in the Poem of the Day folder. I wanted to make sure that I had these poems archived for the future in case the district decided to terminate their contract with Blackboard. I would always have them compiled on my drive. From there, I set up a Poem of the Day tab in my Blackboard class and created weekly folders within that tab. After that, I created my discussion posts. I named each post with the day that the poem would be presented and set the date which they would appear to my students. Students will have 5-10 minutes each day to read their daily poem and answer the question I ask along with the poem. I have the due date set on Blackboard as 11:59 pm on the day the poem is assigned. So, if a student needs more time to work, they can complete their response outside of class My questions will vary and will cover all of those poetry analysis items they will need to know how to do. Sometimes we will discuss the poem in class, sometimes they will just answer and I will respond. I will be doing this with over 50 students a day, so sometimes the grade will just be a completion grade for participating. My purpose in this activity is exposing them to a TON of poetry. I want to almost desensitize them to poetry so they don’t have the fear and anxiety of poetry that I have. I want them to be able to view poetry as a piece of literature and a text just like anything else I give them instead of something scary. Incorporating a daily bellringer also helps create routine and structure within the class. I am hoping to start with some basic comprehension and response questions and then build my students up with their ability as the year goes on. By the end of the year, my hope is they will be able to do a quick but critical analysis of a poem and come up with some IDEAS about the poem that they could write about when asked. I’m hoping the discussion forum setting of the bell ringer helps me stick with this activity. It seems silly, but I always forgot to write the bell ringer on the board. Blackboard should let me sit down and load a few week’s worth of poems and questions at a time, so I have a better chance at following through. 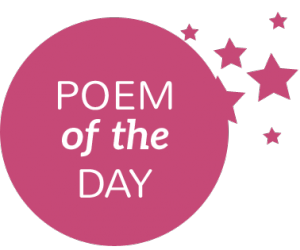 What are some poems that are MUST READS in your class? I wonder if they are on my list. Be sure to check out Edutopia’s original post on 4 Reasons to Start Class With a Poem Each Day. Here we are at the start of another new school year. I haven’t always been excited to come back to work after summer, but working at Beaver Local has changed my perspective. I could have probably gone back to work after the Fourth of July pretty happily. I missed my classroom. I missed my kids. I was going stir crazy at home. August 24 did seem to come quickly though, and before I knew it I was back at school and listening to our new superintendent address the staff. He’s top notch, and I’m excited to work for him. I know there is so much I can learn from him. Also, his relentless pursuit of optimism and positivity goes right along with the way I like to live my life. He had so many great points over the course of our inservice time, but the one that has really stuck with me and I’m hoping to focus on for the year is Be More Dog. On day two of inservice, Mr. Lowe showed us the following video encouraging us to Be More Dog. This just hit me. I can be whatever kind of teacher I want to be. If I want to be a technology using, costume wearing, super teacher, then that is what I will be. Go for it. Dive in head first. RUN. Be More Dog. After we watched the commercial, we were sent out to the back parking lot and instructed to do a carpool karaoke video with our PLC groups we will be working in all year long. Most of us were out of our comfort zone, but the inspiration was written on our faces. Be More Dog. Go for it. Here’s my group’s Buspool Karaoke. Please note how much of a star Mrs. Schreffler is! She was born for the stage. The Be More Dog mentality starts at the top, and they practice what they preach. Here is the Beaver Local Administration showing that they can cut loose and have fun too. The guy with the Beaver mascot head is our superintendent. You can spot the school treasurer in the back left wearing pink. High school principal has the microphone first. High school assistant principal is on the right with the sunglasses holding a stuffed Beaver. Oh, and don’t forget to check out my beautiful momma in the very front right with the hat and sunglasses on. She inspires me every single day to be the best teacher I can be. We control the type of teacher we are. We control our happiness. We control the environment we create for students. Being great is hard work, but it’s worth it when we connect and change the lives of our students. Make a choice, decide the type of teacher you want to be, and just do it. Be More Dog. Join me (and many other Beaver Local Teachers) as we Be More Dog. Holy, cow! It’s already November. It feels like only a few weeks ago I was beginning this crazy journey at Beaver Local High School. The 2015-2016 school year marks my seventh year as a public school teacher, but eighth total year teaching. I thought that by year seven, I had found my groove, but switching from WV to Ohio has been enough to push me out of my groove and into orbit. That’s not necessarily a bad thing, as I am still totally out of my comfort zone (see my last post about the goal of breaking out of the comfort zone). But I am feeling a lot like the hamster on the week. My little legs are pumping and pumping, but I’m not always getting ahead of the rat race. I haven’t taught the literature I am teaching to my students this year since 2008 during my student teaching. We have come a long way since 2008, so I don’t really have anything from then and I have been creating everything I’m using from scratch. This material creation has been exhausting, but so worth while. I have been pushing myself to think creatively on every single assignment. I have been pushing myself out of the box and I’m really enjoying the results I’m seeing from my students. My sophomores just finished reading Antigone and my Seniors are about half way through with Beowulf. The first time I taught these difficult texts, my students really struggled. I remember teaching these the way my advising teacher did during my student teaching, and the students were checked out. This time around, I have worked hard to bring the text to life and it shows in the knowledge, understanding, and appreciation my students have shown of these texts. A coworker showed me the website Kahoot It. I have been using that to help us review. A student actually asked to take the test last week because he was so confident in his understanding of Antigone. That’s something that has never happened in my career. I know when I give these kids the formal test, they’re going to nail it because of the hard work I put into the planning stages of teaching. I typically revamp and create some new material as I go along, but I haven’t started from scratch like this since my first year. I challenge you to throw your old material out and start fresh. It will bring a new and great perspective to the classroom. My new school has a 1-1 initiative. Every kid has an iPad. Some take their iPads home, and some keep them in their 7th period teacher’s room. Because of this initiative, I’m so excited to start blogging this week. We will begin by student creation on Thursday of this week. I plan to let the students create and experiment with their blog on Thursday and Friday. By Friday they will have to have an About Me Section on their page. Stop back and check out our blogs next week! I’m so excited to get my kids writing and blogging. We are all guilty of over enjoying the comforts in life. We want the most comfortable bed, shoes, clothes, and car. We equate comfort with quality of life. When I first heard the idea that the greatest things in life happen outside of your comfort zone, I was a bit confused. Don’t we work our whole lives to achieve comfort? Why would great things happen when I’m uncomfortable? I didn’t really get it, but I’m not typically a risk taker. I’ve never climbed the face of a cliff. I panic at the thought of purging my material items and living in a trendy “tiny house.” I don’t have the need for speed, and I picked my car for safety and comfort over style ad fashion. Leave me in my comfortable bed while you risk life and limb in search of magic. I’ll like your dangerous-feet-hanging-out-of-the-airplane picture on Instagram while snuggling with my puppy and sipping chamomile tea. Then I started thinking about risks and comfort zones within the classroom, and I realized I’m actually a risk taker! Stacy McNally may fear the risks in life, but Mrs. McNally will do anything it takes to improve and make learning fun. Mind. Blown. I’m not afraid to stand on a desk and sing a song I wrote about properly answering text dependent questions. I’m not afraid to send my kids on a scavenger hunt throughout the school for pieces of a puzzle to create the perfect thesis. I’m not afraid to start blogging with my students when all the other teachers in my building are still writing traditional essays. I’m not afraid to dress like a puritan woman and walk through the halls during class change to get my kids excited about what we are doing in class. I have certainly failed when taking risks. When I dress in costume and walk with (okay, maybe chase) my students down the hallway, they are mortified to know me. They call me crazy, but they are excited to come to class. I spent the last six years of my career teaching in West Virginia. When we added twin baby boys to our family, being away from home didn’t feel right to my husband or me any more. We needed our children to be raised with family. My husband started his job search first to bring us home. He was a police officer, so we thought he would have a tougher time finding the right job. We thought wrong. Within a month, my husband had landed an amazing job and was set to begin at the start of the year. It was one thing to talk about making this huge jump and moving back to my hometown. It was another to actually do it! I started getting my portfolio ready to present to a future employer. I filed my paperwork for Ohio certification, and eventually I had an interview at my dream school. I was hired and I will start teaching at Beaver Local High School in a few weeks. They have a 1-1 initiative which will allow each student to have their own iPad. Their new K-12 School is the most innovative school in the state (and I would venture to say country). I am so excited to begin this new journey. Since beginning this transition to come back home, I have told myself over and over, “The magic happens outside of your comfort zone.” I have taken this risk in uprooting my family and career with the faith that magic will happen. I am confident that my new school will allow me to blossom into a greater teacher than I could ever have imagined. I’m determined to continue to push myself until I am making magic in my students’ lives every single day. I believe it will happen. If you’re interested in seeing my journey to the magic, subscribe. 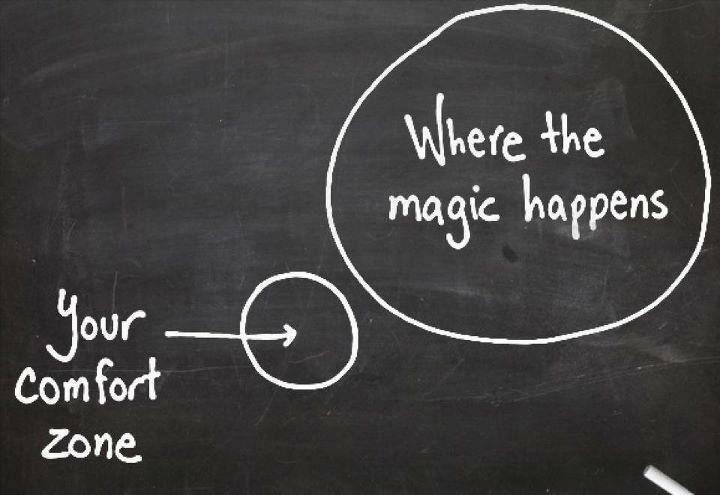 I will keep you posted on the highs and lows of teaching outside of my comfort zone. This semester I incorporated blogging into my classes. I decided to use Edublogs and encourage each student to set up their own blog. All the individual blogs link back to mine, and students can see one another’s work on their “Dashboard” when logged in. This is nice because instead of clicking on the link to each student’s page and then searching for the posts, recent published posts show up on the dashboard for easy reading. Students can then create lists or subscribe to peer’s blogs for easy reading. Edublog allowed me to monitor and have editing rights to the students posts in an educational setting. Edublog was easy to learn and my students picked up the basics so quickly. I did pay a small price for a year long subscription to a Pro Account, but I believe it was well worth the nominal fee. Edublog has tons of resources to help you format and make your blog as complicated or as simple as you would like. I do not have experience using other blogging platforms, but I would highly suggest Edublogs to anyone looking to get into blogging for the first time. I know nothing about coding or website building and I think my blog is pretty impressive. Even if you think you can’t blog, you can! Now, on to why you’re really here- How blogging has transformed my teaching! I was apprehensive about how blogging would impact my classes at first. I wanted to make sure that blogging was meaningful and not just replacing typical essays we would write in class. I was worried I would not be able to find the balance between students writing for academic purposes and students writing for self expression. Looking back, I had nothing to worry about. I was able to easily balance the blogging assignments so my students were able to show their personality as well as practice fine tuning their writing skills (specifically research and citation skills). Obviously I worked with my students on the writing concepts I wanted them to display in their blogs, but the real magic happened when students were reading one another’s posts and interacting in the comments. I hoped this would happen, but I wasn’t sure how much I would have to coach them to make meaningful connections with their peers work. At first, I instructed students to comment on a certain number of posts, and I even gave them guidelines about what to include in their comments. Once students had a baseline understanding of my expectations, they took off. Most students read every single one of their peers’ posts. Many students commented tons of posts. All students talked about posts and suggested posts to their friends to read. Seeing my students engaged in one another’s writing and beliefs and opinions was powerful. Can you imagine if every student printed out their persuasive essay and we passed them around class to read and comment on? WOOF! I’m even bored thinking about grading all those assignments that way. Blogging made the writing fresh and fun. Blogging made my students interested in what their peers had to say and opened up so many meaningful classroom conversations that would have never happened in a traditional classroom. I also noticed my students working harder to produce quality work. Most students knew that their friends and peers would read their posts, so they wanted to make sure they were bringing their A game. Students were naturally revising. Through my teaching career, I have struggled to get students to actually go back into their writings and revise and edit. With blogging, my students were publishing their post, viewing it on their page, going back and changing formatting, editing grammar and spelling mistakes, revising and changing because they wanted their work to be the best it could be. Their writing went from being a teacher-student communication to a public communication. They were intrinsically motivated to make their work better because they knew more people would see it. This is not to say all posts are perfect. If you look through my students’ pages, you will find plenty of mistakes. My students are still just sophomores in high school and they make plenty of mistakes. That’s how they grow. I saw every single student grow and develop as we were blogging. The student blogs allowed each student to show their personality in a safe manner. Today’s student is different than even my friends and I were in high school. We were starting the online movement with chat rooms and AIM. But our students now are often more comfortable behind the anonymous nature of a computer screen and screen name. Students could show their personality by choosing a theme they liked or customizing their blog with images and fonts that showed off who they are. We spent a few days in class experimenting with the looks and layouts of the blogs. Their first assignment as to delete the sample pages, create a tag line, and publish an “about me” page. It was really awesome to see kids figuring out how to do something and then teaching one another what they learned. Students were looking at their peers’ pages for inspiration and giving praise when someone figured out how to do something cool. Blogging allowed my students to break out of their shells and form relationships with students they never would have worked with or even spoken to. When a self proclaimed “redneck” read a post by a transgender student about the struggles LGBT people face, I saw one of the most powerful conversations I have ever witnessed. These two students probably would have avoided working together at all cost, but were able to form an understanding because of their blogs. When I decided to start blogging, I wanted to make sure my kids would learn the same skills as the other 10th graders who were writing one long persuasive essay (for the whole semester) with a fresh and new spin on writing. I wasn’t sure that I would be up to the challenge of many smaller argumentative essays, or that my students would even like blogging. My fears were totally unfounded. My students embraced blogging (and dare I say LOVED it) like I hoped they would. Although initially blogging was intended to really replace what we were doing traditionally, it opened so many more opportunities and dialogs that traditional writing has never allowed in my classes. Writing was redefined by student blogs and I will never go back to the old ways. Blogging transformed my teaching and my students’ learning in just a few short weeks. I am so excited to start next year with blogging. I cannot imagine the impact an entire year of blogging will have on my students, but I have some really great ideas about how our student blogs can really change the culture of a school. Stay tuned, because I know you’re going to like what’s to come! 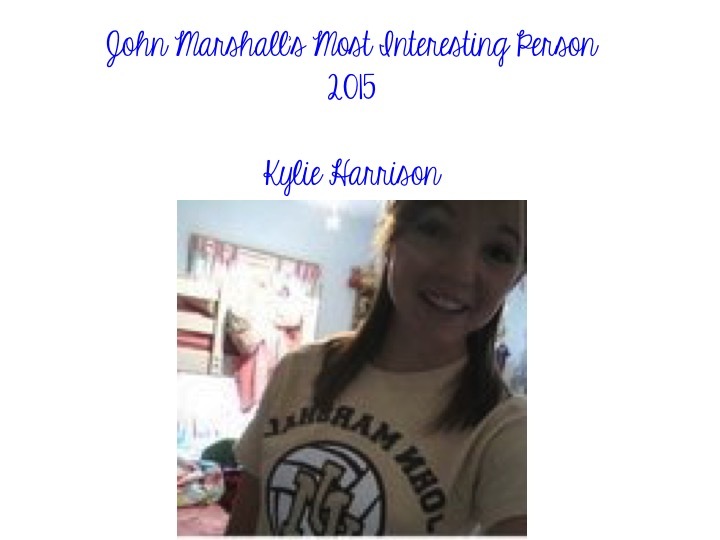 John Marshall’s Most Interesting Person, Kylie Harrison! Congratulations to JM Sophomore Kylie Harrison for being named Most Interesting Person by my sophomore English classes. Kylie’s story was written by Hannah and can be read by following the link below. Thank you to everyone who participated and voted! Voting is now open for the JMHS Most Interesting Person. Please cast your vote here. Pick your top 3 favorite stories. Remember, vote for the best/most interesting story and you may only vote 1 time. This week is teacher appreciation week! I treated myself to a much needed pedicure to show myself some appreciation, and my school’s administrators are treating teachers to lunch tomorrow. For me, that’s more than enough. I have thought more about planning out the rest of the year than worrying about just how much I am appreciated this week. Today I had one of my favorite administrators in my classroom, and he asked my students what they had done to show their appreciate of me during the holiday week. They were surprised to hear that it was teacher appreciation week, and wondered why I hadn’t told them so they could appreciate me appropriately. I joked that it wasn’t my style to demand their appreciation, but they encouraged me to tell them what I wanted. This post was born from that request. I love when my students come into class and greet me with a, “Hi, Mrs. McNally” and a smile. Please say hello and be happy! I work hard to come up with lessons to enhance your knowledge and skills. Participate in the lessons all week, and give me your undivided attention. Be nice to one another. I like you all and you all should like one another. If you can follow all my above requests and make me laugh, you will have the happiest English teacher in the world! Gifts of food are delightful at all times of the year. Tacos are appropriate for teacher appreciation week as it coincides with Cinco de Mayo. I would love a parade worthy of a Super Bowl winner or Stanley Cup champion. Some of the things I get you students to do, trust me. I deserve it! Not from you. A gift certificate will do. Grading is stressful! You all know how rough lunch C gets. I’m starving! Better bring buffalo chicken dip to go with the tacos. Back to the Super Bowl and Stanley Cup… don’t they get rings? Yeah, I’m thinking a big ring will do just fine. Sometimes a kind word is plenty. I kid, I kid. I don’t need food, a massage or jewelry to know my students love me and appreciate me. Saying thank you to your favorite teacher is a great way to show your appreciation. If you’re still in class with that teacher, greet him with a smile, be nice to your classmates, and work hard while you’re in class to really show you care. This morning, after dropping my twins off at the babysitter’s, I was walking to my car when a neighbor was walking past with his dog. He was frowning and didn’t look very happy to be out and about at 7am. He glanced over at me and I greeted him with a smile and a bright, “Good morning!” I didn’t think much of it, as it’s a pretty standard procedure for me to greet anyone I see. As I pulled out of the driveway and went along my way, I had to drive past the man. This time, I noticed he was smiling from ear to year. A few moments before that, he had looked miserable. Had my smile and words changed his perspective? I attended a small college of national distinction in the hills of West Virginia- Bethany. What struck me about Bethany when I toured as a high school senior was that everyone seemed so happy. Professors welcomed us into their classes to show us experiments they were working on (I still remember the fruit flies and how the professor explained their breeding habits although I have long forgotten his name). Students smiled and said hello as we passed through the corridors of Old Main. Everyone made eye contact and greeted you with a smile as you passed. I actually wondered out loud if they had placed these people just for the tour, but our guide assured me that was just how people acted in that cheery little town. People were just generally nice and kind. Although this wasn’t my only reason for choosing to attend Bethany College, it did influence my decision. Bethany’s outlook on strangers also changed the way I went about my day for the rest of my life. I always say hello and good morning when I pass colleagues in the halls. It’s funny to me how many people will put their head down and not acknowledge someone passing just feet away from them. I’m as guilty as anyone for getting caught up in my own troubles and problems, but sometimes one little interaction can change your whole perspective. If I’m having a rough morning, a bright greeting from a colleague may change my mood and leave me walking away with a smile. It’s only fair that I give that back whenever I can. I try to greet as many of my students as I can by name in the hallways with a hello, a smile, and a question about how their English class is going this semester. Some of my students seem mortified that their teacher spoke to them in front of friends, but most leave walking away with a big smile. 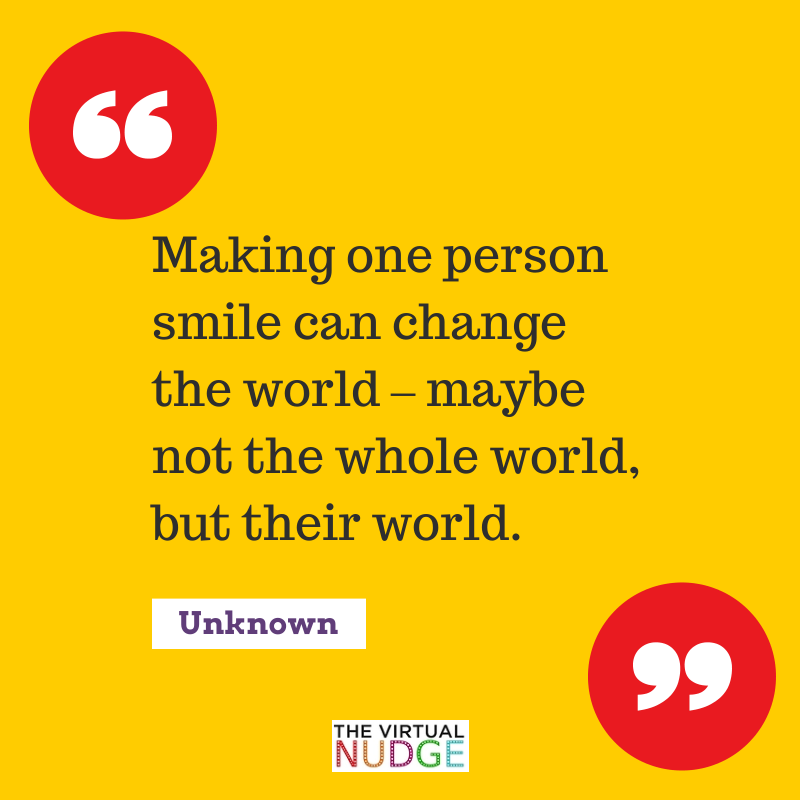 I hope they pass that smile and kindness on to someone else as they go. I really believe that a kind word can change a day for the better, like a harsh word can send a day into a downward spiral. I believe niceness matters. I really have no idea if it was my words that perked the man up this morning, or if he was just amused by something his dog did. 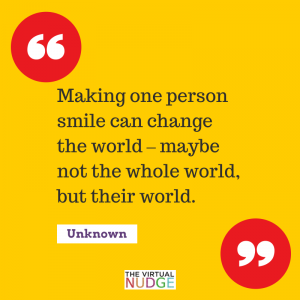 But it really made me remember that a simple greeting and a smile can change a person’s world. Congratulations on your first English teaching job in public school! You are going to have some tough times ahead of you, but they will help you grow in to a great teacher. I’m writing to you from year six, and I can promise you that you will love your job soon. Here’s some advice about a few things I have learned along the way. I hope it helps you through the rough spots that you will inevitably face. 1. Don’t try to be the coolest teacher. Be the best teacher. In your first year, you will struggle a bit to find the balance of being a good teacher and being well liked by students. At first, you care a little too much about being well liked and not enough about being effective. You spend a little too much time off topic and not enough time focusing on developing skills. It is more important for a teacher to have students respect than their favor. You need to try and find a balance between fun and effectiveness. Students will respect you for creating a solid rapport within a challenging class. Students will enjoy your class because you are a great teacher. They will enjoy your activities and lessons. They will laugh with you and learn with you if they can respect you. 2. You can never regain control once it is lost. It is essential for you to start the year on a good foot. You should work hard at the start of the year to teach your students the policies and procedures you want them to know. This is when you establish the accepted behavior of the class. Your first year at JMHS started in a whirlwind. You were hired on Thursday and you started the following Tuesday. It took you some time to get on your feet and running, and it showed. You didn’t take the time to set proper policies and procedures because you weren’t sure how things were done at your new school. Once you were comfortable, you struggled to regain control of the class and hold them accountable. In the future, set the standard for acceptable behavior and classroom rules from the start. As a veteran, I now start the year on a strict note and I tend to loosen up as the semester goes on. If you have the opportunity to start at a new school, be confident that you know the right way to run your class, even if you may not be comfortable with the school’s way of doing things yet. 3. Follow your heart, your gut, your brain, or any other vital organ giving you messages. Your first year Your first few years at John Marshall were rough emotionally. You knew what you should be doing for your students, but that wasn’t always the norm for the other teachers in your department. When you tried to innovate, they talked about you and ridiculed you. So you stopped. You adopted their old school ways of doing things and your student engagement dropped. You student discipline problems skyrocketed, and you hated your job. You put what you believed was right on the back burner and you did what everyone else was doing. It took you a few years to realize the disservice you were doing for your students. Around year four you will throw caution to the wind and do what you have known was right all along. Do it sooner. Follow your heart and connect with your students in the way you know is right. 4. Consider what the best teachers would think. My decision to do what was right instead of what was normal came after reading What Great Teachers do Differently. The book encourages teachers to consider what the best teachers in the building would think of your words, actions, lessons, and behaviors. This was groundbreaking for me. What would Mrs. Kuskey think if she walked into my room right now? What would Mrs. Dewitt think of this email I’m about to send? What would Mr. Little or Mrs. Joseph think of the way you’re teaching this story? Would Mr. Swiger think this PBL was a waste of essential class time or would he believe you were growing students’ problem solving and cognitive thinking abilities? When I thought of these teachers in comparison to myself, I realized I needed a change. From your first year on, consider what the best teachers would think of the happenings in your classroom. Elevate yourself to their high standards. 5. Hold students to higher standards. First year was rough, and understandably you struggled to find a balance between what your students could do and what you expected them to do. When students didn’t meet your expectations right away, you lowered them to try and help students succeed. You didn’t realize it at the time, but you were really not helping them at all. Students will test you to see what they can get away with. Naturally, most won’t do more than they have to due to the lack of intrinsic motivation in a traditional classroom. Set your expectations high and stick to them. Then find ways to motivate your students to meet the goals. You figure this out pretty quickly, but it’s worth the mention. 6. Stay away from the drama. Dr. Camden taught you to stay out of the teacher’s lounge, and you follow her directions. But there are plenty of other hubs for negativity in a school too. Really, you need to approach your day with a mentality which keeps you free from the negative undertone which ripples through schools. When people complain, try and offer a solution. Understand that it is easier for some people to see the bad then to fix the problems. Do what you can to help, but don’t be part of the problem. You have a powerful voice that you can use to move the school forward in a positive way. Around year 5 you embrace your voice and work hard to stay away from the negativity (The No Complaining Rule was the game changer for this mentality). Do it sooner. You, and only you, control your happiness. If you want to love your job, make it happen. Kids feed from your energy, make sure what you’re putting out into the world is positive. You don’t know it all. You don’t even know most of it. Continue your education on your own. Your school before JM would send you anywhere you wanted to go for professional development. Marshall County has a ton more teachers than Abraxas had, and they cannot offer you the possibilities of attending any and every training you want to attend. But in today’s day and age, you can do it alone. Get online, read, and connect with educators all over the world. Use Twitter, read studies on motivation, and continue to take classes. There is so much more you can learn and do. You don’t need county funds or CE days to learn. Let your students see your silliness. In a few years, Dave Burgess will write Teach Like a Pirate and it will describe the teacher you have always wanted to be. Lose the fear; Embrace the crazy. Wear costumes, speak in accents, decorate your room, teach creativity, and let your passion show. First year me, you’re going to make it through the rough times. There will be lots of smiles, laughs, and a few tears. You will grow into a strong and confident teacher. You will connect with hundreds of kids and you will change lives. Some days are hard, but looking back I can honestly say that they were all worth it.